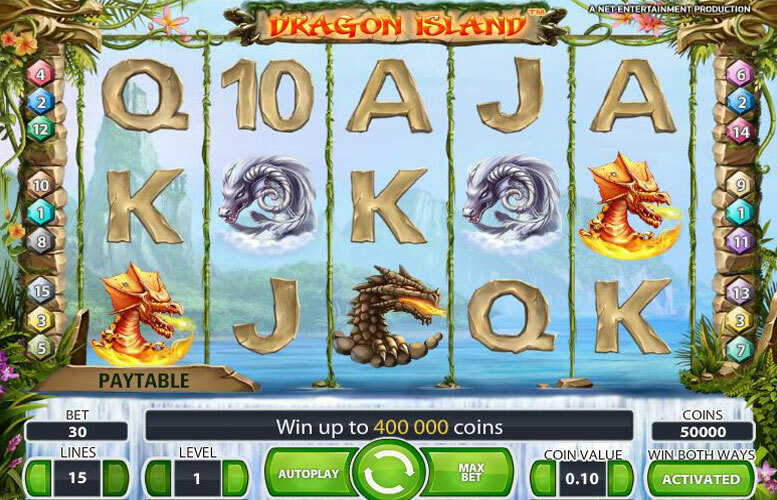 If you like the sound of a 400,000 coin maximum jackpot then the Dragon Island slots game might well be the one for you. Take this fantasy themed slot for a spin and win free spins, cash in on it’s two wilds and bag yourself hundreds of thousands of coins! We love the amount of color used in this game. Everything is so bright and animated it makes it easy to get caught up in the game. There are a lot of symbols in this game that are very similar, but the noticeable difference in color makes it easy to tell them apart so there is no confusion. The Winn Both Ways feature is great, allowing you to get twice the earnings for placing the exact same bets you did before. There are also a lot of wilds on the board (regular and golden) that make it easy to get more matches with every pull. The coin values are pretty low here, 0.50 and below, but the top jackpot is 400,000 coins which is outstanding. All in all, we would recommend this machine to anyone who likes low stakes betting but the potential for a very big payday! The top prize here is impressive, coming in at 400,000 coins. 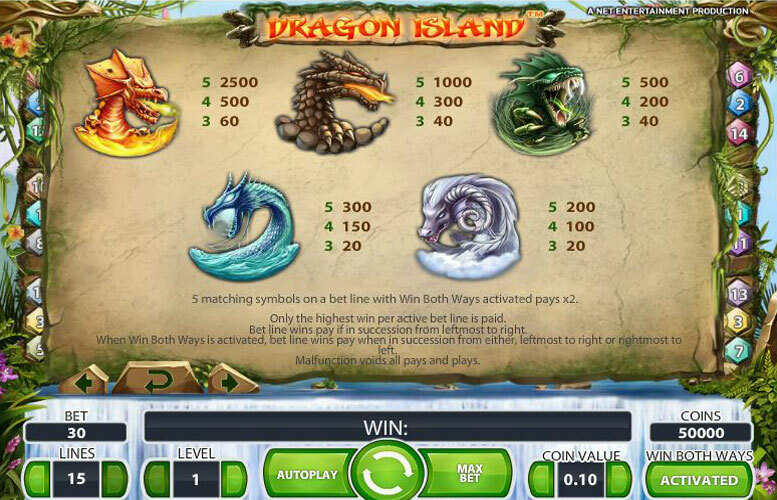 The only way to win the maximum jackpot is to line up 4 fiery dragons on the board along with a Golden Wild symbol (which doubles your payout). To win the top prize you need to play in Win Both Ways mode, where you double all of your bets and get paid from right to left and left to right on any payline. Win Both Ways mode also gives you an extra wild card, which makes it easier to match up winning combinations. You can also use these wild cards to match the fiery dragon, which increases your chance of winning the jackpot. 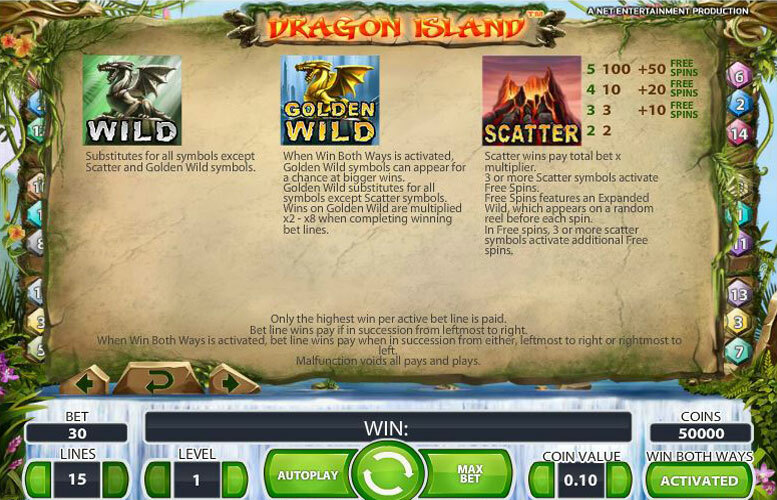 The golden dragon also applies a multiplier to your winnings, making it easy to get more for each spin as well. There are two sets of betting limits for this machine. Players will play with 5 reels with 15 pay lines. You can bet anywhere from one to 50 cents per pay line, so this is not a slot machine for those who want to place large bets. Like most games, only one match will count per spin, so your winnings are based on the highest spin you earn. There are 10 betting levels available in the game based on the number of coins you would like to attach to each outcome. In regular gameplay you can bet up to 150 coins per spin, which entitles you to half of the maximum payout. When you enter into Win Both Ways mode your maximum betting doubles to 300 coins, with all bets below the maximum doubling as well, making you eligible for the full jackpot. Black Dragon – This is the wild. You can substitute it for any symbol except the scatter in order to get a higher match. Gold Dragon– The gold dragon is an additional wild. This is only available when you are playing in Win Both Ways mode. It can be used to replace any symbol except the scatter. This wild will also increase the payout anywhere from 2-8 times and only appears on the 3rd reel. 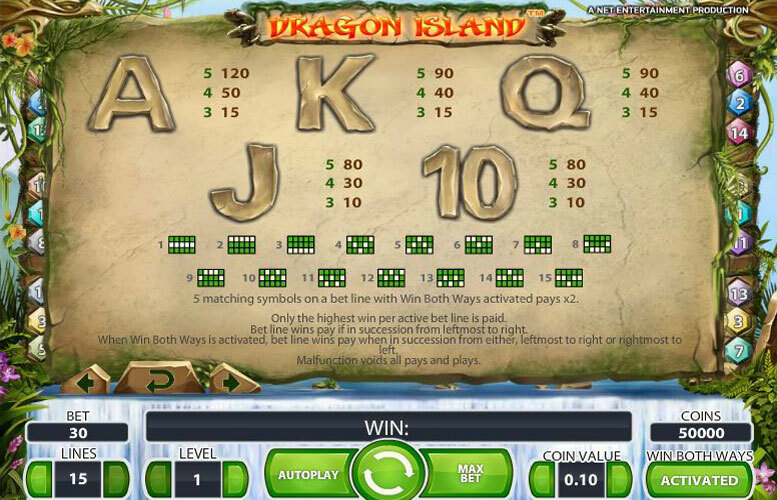 Fiery Dragon – This icon is used to win the top jackpot. You must match 5 to collect the maximum amount of winnings. It can appear on any of the reels and you can also match this symbol 3 or 4 times to win 60 and 500 coins respectively. Volcano – This is the scatter. It can be used on any reel to win 10, 20 or 50 extra spins. Any winnings from the scatter are tallied independently of your winnings from the other lines so you do not have to worry about this taking away from your prize. Dragons – Dragons include the volcano stone dragon in gray, swamp dragon in green, sea dragon in blue and mountain dragon in purple. Any of these can be matched throughout the board in order to win coins. You must match at least 3 dragons in order to earn a prize. Dragons offer 20-1000 coins per pull with the exception of the fiery dragon outlined above. Stone and swamp dragons are worth the most, followed by the sea and mountain dragons. Playing Cards – These cards range from 10 through Ace and are used to create your matches throughout the board. They are scattered amongst all the reels and require you to match up at least 3 to get a prize. These offer low winnings, anywhere from 10-90 coins depending on the amount of symbols matched. This game has a rating of 4 / 5 with 418 total reviews by the users.